Steven's lovely surprise proposal to Heidy at Green Lake park (she said yes). Thanks Nicole for helping with the lights! Whether it's nature, gardens, playground, city, golden hour, after dark, sports, etc., picking up a theme is an optional first step in planning your photo shoot. You might already know exactly what you're after. That's great! But if you don't, and you're looking for some inspiration, don't hesitate to contact us. A quick e-mail exchange works great to brainstorm some ideas. The web is also a great resource to find inspiration. Not having a theme is perfectly fine, too. We can be as planned or as spontaneous as you'd like. It's important that what you wear represents you, and that you are comfortable and confident with your outfit. What you choose to wear is also tied to the portrait theme that you're after and the location we're shooting in. The outfit you choose should not distract the viewer too much, but rather it should help bring focus to you and make you look your best. Consider bringing more than one outfit. Favor solid colors because contrasting patterns may take the focus away from you. Avoid thin stripes at all cost, they create a moire pattern that does not render well on a computer screen. Favor fabrics that are textured and not very reflective. Consider wearing both top and bottom in either dark or light tones. Consider colors that complement each other. Factor in your background. The location we'll be shooting in is vastly important. You risk blending into the background by wearing a similar color, or a contrasting pattern. Spice up your image with a favorite accent color, but avoid a very powerful one which will take focus away from your face. Avoid accessories like excessive jewelry that may distract the viewer, unless that's your style. Be aware of the color of your socks, so they don't stand out in a way that distracts. Avoid wearing something brand new, unless you know it fits you right and you won't be concerned about how it looks on you. Think about what you're going to do with the photos, how are you going to present them. Does your planned outfit match your intended purpose? It's not a bad idea to examine the clothes for lint, and give them a quick roll if needed. Consider coordinating your outfit by choosing a color palette and mixing it up amongst yourselves. Avoid having only one person wear an accent color to avoid them capturing all the viewer's attention. You all are important. Be creative with your hairstyle and your makeup. A safe bet is to just wear what you normally do, to look natural. Think about whether your hair and makeup works with your selected outfits. Certain haircuts take a little longer to look their best (especially for men), so you may want to avoid getting a haircut right before the day of your photo shoot. Avoid doing drastic changes that may make you self aware during your shoot. Get your beauty sleep in. We look our best when we are well rested and just a few nights of good sleep make a difference. Consider bringing one or more accessories with you: hat, belt, umbrella, scarf, rain boots, head-phones, etc. You could use them to create a new look on the spot. At times, using props - anything from a chair to a blanket - can complement your portrait session and create a unique spin to your photos. If you have one or more objects that you're attached to, like a musical instrument, or anything else for that matter, bring it along and we could try to use it. For kids, consider bringing their favorite toys, a book, a ball or any objects that they enjoy playing around with. Of course they're part of the family! Whether you want to include your cat or dog into your family photos or you want them as the star of the shoot, we're up for it. Let us know in advance in case we need to prepare. Most of us are a little nervous in front of a camera. No need to worry! We're going to do our best to make the camera disappear and we'll have a great time. We're flexible to meet on your schedule and sometimes we have to account for the weather, if we're planning to shoot outdoors, and also for the unexpected. 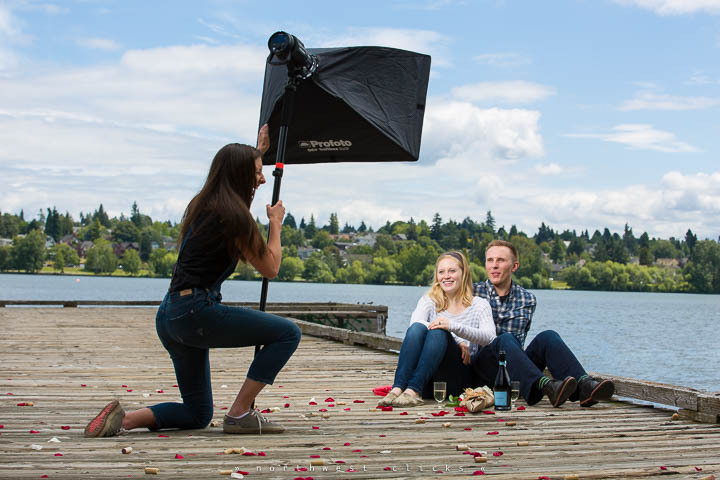 That's why we suggest setting aside more than one date for your shoot, just so we can have a plan B. We could also play a little weather detective game and be ready to go, or postpone, based on realtime weather updates. This makes it more exciting, especially for kids. Usually, the best time of the day is just a couple of hours before sunset, but if it's overcast, any time we choose is going to be just as good. Choosing a location is an important part of our planning. There are many places we can choose from, but we'll know which one is right after we decide on your portrait theme. Parks: they usually have colorful grasses, trees that offer shade, flowers, pathways, nice wooden fences, benches, swings, playgrounds, climbing walls, etc. City: they may offer neutral backgrounds, "natural" reflectors, walls with cool patterns, interesting backgrounds like street lights, busy streets, storefronts, wet pavement, pathways, stairs, benches, bikes, structures, etc. Your own neighborhood, home, yard, or patio: it provides a great setting for your portrait. Indoors: Timeless white or dark backgrounds, color effects, props, etc. For kids' sessions, it's great if we choose a place where they feel relaxed, where they've been to before; or quite the opposite, somewhere that's completely new and fascinating to them. We can help, just tell us where you live and we'll recommend something that works well based on the season and weather. The session fee is due at session time. We prefer check and also accept credit cards, including contactless and chip. We run our business from our home in Sammamish and we have remodeled our garage into a spacious studio - not fancy, but very functional and welcoming. We can accommodate groups up to 4. We have the option for a classic white, gray, or black backgrounds. We could order (or create) a specific color, too, if you have something in particular in mind. We love the timeless feel of white or black, though, or the sharpness of neutral gray for business portraits. We do not provide props for your studio session, but we are more than happy to accommodate anything that you would like to bring along (that fits). Keeping the set simpler, though, makes for less distractions and more focus on you. Clothing choices and mixing in accessories (for instance, gloves or scarves) make for a super fun and colorful photo session. We can help bounce around more ideas as we prepare for your session. Images that come straight out of the camera are still a long way from being ready. A lot of time goes into editing, almost always more than two or three times it takes to capture them. Usually, we take about a week to edit and deliver your images. If it's going to take more, we'll let you know in advance. We deliver JPEG files at various resolutions, including originals. File sizes can be anywhere between 5 and 15 megabytes. The full size of the download may reach the order of hundreds of megabytes. Some images may have a different crop/aspect ratio and size. While we always do our best to present as many images as possible, know that not every one that we take during your photo session will make it into your selection gallery. This is normal and part of the selection process. Just like any other artist, we take pride in our work and we want to display it for others to see. We thank you for allowing us to display a handful of your best images, strictly for the purposes of self promoting our service. Print at home, or though a 3rd party such as a local or online print shop. If you need to use any of the photos for commercial use, please get in touch with us in advance.